Sign up for makeup workshops and learn about new products and techniques for creating a variety of different effects. Participants will have all make and supplies provided and will have an opportunity to do the makeup they have learnt on a model or another workshop participant. Classes take place in our store (1515 Center Street North, Calgary). Bring a pen and paper if you would like to take notes, and drinks or snacks if you would like. Most classes are in the evening from 6:30-9:30p.m. but some classes may run later so please be prepared. Please make sure to dress appropriatly, makeup can be messy so don't wear your best cloths - especially not for casting classes or classes with lots of blood. Due to limited space there will be no refunds for no-shows or cancelations. Maximum 10 participants. Please bring a model to work on. The purpose of this workshop is to teach two different types of burns using different products for each. This gives the person applying the makeup a chance to learn about the various strengths and weaknesses as well as the varying application methods of these products. The more varied experience gives the artist more options and flexibility when considering how to create burn effects in future applications. The face burn will be an acid burn complete with a little bit of smoking from the burned flesh. The arm burn will be a 3rd degree burn with some exposed bone. Your model should be wearing a short sleeve shirt preferably without a collar. Remember we are using products that can stain or worse so you and your model should dress accordingly. Makeup will need to be removed from model before application of burn makeup is applied. If their are any latex allergy issues please let us know before day of workshop so we can provide alternative products. This class is our second in our new Creature Workshop Series and is going to focus on water creatures. Again it is all about your imagination! We will be providing a variety of prosthetic appliances (including gills) and 3D products to create your own look as well as our full repertoire of colors, glitters, shimmers for you to use to enhance the creature you create. Mermaid? Fish creature? Fish Monster? It is all up to you! Make sure you check with your model on any allergies like latex. Both you and your model should dress appropriately for the class, it can get messy. This is a messy workshop! You will be applying to your model a 3D prosthetic slit throat. The slit throat will be hooked up to a device that we will use to pump blood through at the end of the workshop. The skill set we will be working on will be prosthetic application including proper, seamless blending of prosthetic to skin and coloring of prosthetic. We will go over RMG, alcohol makeup and cake makeup and discuss the pros and cons of each. The finale will of course be the bleeding effect. Your model should be aware any clothing they wear could be stained despite the precautions we take - this includes under clothing and shoes. This class is MESSY!! This workshop is a lot of fun because you actually build a broken arm from scratch unto your model. The end result we will be working towards is a visually realistic three dimensional broken bone. We will be using a variety of products and will discuss alternative options as well going into the pros and cons of each. We will also discuss several 3D options as well as blood choices. To complete the injured state of your model we will do some bruising effects on the arm and face including a black eye. Your model should be wearing a short sleeve shirt. Remember we are using products that can stain or worse so you and your model should dress accordingly. If their are any latex allergy issues please let us know before the day of workshop so we can provide alternative products. The third workshop in our Creature series will end with Ice Effects Creatures. Here again we will provide various prosthetic appliances (horns, noses, etc.) as well as product to create your own 3d effects. We will be using ice and snow effects in our demo ice creature and participants will also have these products available for their own creature along with a myriad of color palettes, glitters and inks. Make sure you check with your model on any potential allergies such as latex and as the makeup can be a bit messy both of you should dress accordingly. A new casting class for 2019! This is the perfect class for people who cosplay and want to create their own ear prosthetic appliances for various characters. We will have a demo after which we will pair the participants off and they will cast one of each others ear in turn. The casts will be filled with Hydrocal. Casting classes can get messy so please dress accordingly. All ear piercings must be removed prior to casting. $75.00 + GST. Participants recieve a face paint palette to keep! This is another pioneer workshop and the focus will be specifically on Halloween makeup for children. The makeup we have at Don's is of course safe for adults and children however some products are definitely easier to apply and remove then others. We will discuss various products and options for different Halloween looks and then demo a couple of different Halloween makeups on our models. Our participants as always are encouraged to bring a model to work on and in this case children are especially encouraged since the makeup is for them anyway! We will have a palette for each participant to use and keep. We will also have other products available to use on your model. Playing with makeup is fun and we will encourage both artist and model to have some fun! Halloween Treats will be provided so give us your best "Trick or Treat!" This has consistently been one of our most popular workshop since we started 6 years ago. The goal is to create a scary zombie with trauma wounds on the face and arm. 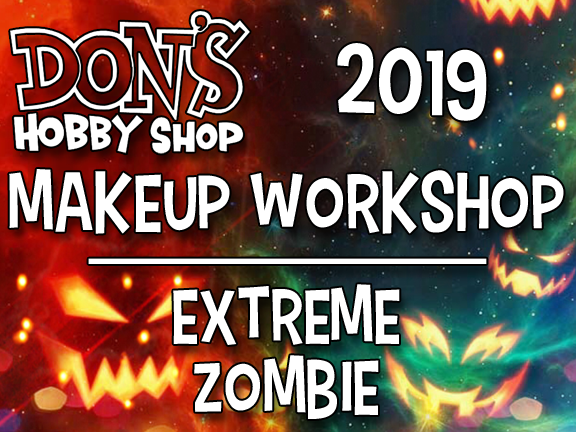 We will go over the necessary contouring to create an appropriately hungry looking zombie but when the demonstration is in progress we will include alternatives so that each person in the workshop can use their own creativity to make their zombie unique. We will go over several traumas that you can choose from to add to your zombie. We will be using a variety of coloring, blood, dirt, and will discuss alternative options as well, going into the pros and cons of each. Your model should be dressed preferably in old clothes that can be zombified... as this can be a somewhat messy workshop. A short sleeve shirt collarless shirt would be best. If their are any latex allergy issues please let us know ahead of time so we can provide alternative products. It is a tradition that we always demonstrate a surprise "gross out effect" as our finale for our last workshop before Halloween and this one will be no exception! A group photo sounds like a great idea!